As one of only 12 Special Olympics athletes around the world, Nebraska’s own Jason Gieschen has been selected to serve as a Sargent Shriver International Global Messenger (IGM) for the next four years. Special Olympics Sargent Shriver International Global Messengers are Special Olympics athletes appointed as spokespersons to spread the message and vision of the movement, representing not only the organization as a whole, but their individual countries as well. As leaders and message-bearers of the movement, International Global Messengers communicate the powerful declarations of hope, acceptance, dignity and courage of Special Olympics athletes around the world. Ten countries are represented in this year’s class: Austria, Botswana, Egypt, Indonesia, Korea, Macau, the Netherlands, Panama, Thailand, and the United States. From April 19 – April 26, the new class of International Global Messengers will meet for the first time at Special Olympics headquarters in Washington, D.C., for an in-depth training sponsored by Bank of America to gain the critical skills necessary to serve as global athlete leaders and spokespersons. Jason Gieschen of Ogallala has been participating in Special Olympics Nebraska for over 15 years. During that time he has competed as an athlete on a national level, served on the Special Olympics Nebraska board of directors, sang the national anthem at the 2010 Special Olympics National Games and successfully served as an athlete ambassador across the state of Nebraska. 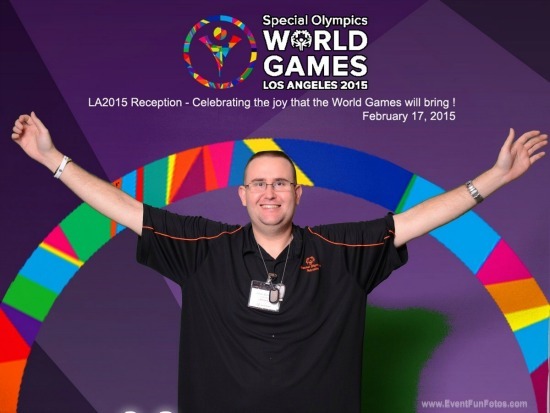 “Once I found Special Olympics I felt empowered to speak up for myself and other athletes. I understand the 'inclusive aspect' as I have lived it. In school I was not always accepted for who I was. I learned differently—therefore I was different,” Jason told us. “If there is anything that is important in this world it is to have dignity and be included. I have also learned that sportsmanship is more important than winning. I have a bracelet that says, 'Difference Maker--Today is the Day--I am the One.' I want to be that Difference Maker." Jason's mentor in his International Global Messenger journey is Scot Caldwell of Gallup. Scot will help coach Jason through his speaking engagements and travel with him to appearances. Named for the late Sargent Shriver, Special Olympics founder Eunice Kennedy Shriver’s husband, the Special Olympics Sargent Shriver International Global Messengers program is part of the Special Olympics Athlete Leadership Programs (ALPs), which offers leadership, public speaking, and advocacy training to athletes interested in representing the organization. IGMs are an integral part of the Special Olympics organization. The IGM role is an extremely competitive and sought-after role within the organization – this year’s candidates included 73 applicants from 22 states and 39 countries around the world. They were selected based on their demonstrated interest participating as ambassadors for Special Olympics beyond sports and competition, their overall leadership skills and personal story representing Special Olympics. They will attend events in their respective regions and throughout the world, making speeches, presenting awards, and supporting the development of the athlete leadership strategy. This new class of IGMs will serve a vital role in the upcoming 2015 Special Olympics World Games in Los Angeles from July 25 – Aug. 2, participating in the Opening and Closing Ceremonies, attending and giving speeches at various events, cheering on their fellow athletes, and interacting with many of the honored guests in attendance. The first class of Special Olympics Sargent Shriver International Global Messengers was inducted in 1998 to mark the 30th anniversary of Special Olympics. Every four years, 12 athletes are selected to train through the Sargent Shriver International Global Messengers program and serve as primary spokespeople on behalf of Special Olympics, appearing in national and international media outlets, carrying forth the themes that are most important to athletes in Special Olympics Programs around the world. There have been a total of 84 International Global Messengers selected to date. Sargent Shriver International Global Messengers are nominated by Special Olympics regional staff and chosen by a leadership committee at Special Olympics headquarters, who review all applicants and determine final selections based on athletes’ leadership skills and interest in serving as spokespeople for the organization. International Global Messengers training sponsor Bank of America is also presenting sponsor of the Special Olympics Unified Relay Across America, a 46-day torch run that will visit all 50 states and bring the Flame of Hope from Athens, Greece to the 2015 World Games in Los Angeles. Bank of America is also an official partner of the 2015 Special Olympics World Games in Los Angeles.